The Principality of Antioch in the context of the other states of the Near East in 1135 AD. It had roughly 20,000 inhabitants in the 12th century, most of whom were Armenians and Greek Orthodox Christians, with a few Muslims outside the city itself. Most of the crusaders who settled there were of Norman origin, notably from the Norman Kingdom of southern Italy, as were the first rulers of the principality, who surrounded themselves with their own loyal subjects. Few of the inhabitants apart from the Crusaders were Roman Catholic even though the city was set under the jurisdiction of the Latin Patriarchate of Antioch, established in 1100. This patriarchate would endure as a titular one after the Crusades, until it was dropped in 1964. The Siege of Antioch, from a medieval miniature painting. While Baldwin of Boulogne and Tancred headed east from Asia Minor to set up the County of Edessa, the main army of the First Crusade continued south to besiege Antioch. Bohemond of Taranto commanded the siege which commenced in October 1097. With over four hundred towers, the city's defenses were formidable. The siege lasted throughout the winter causing much attrition among the Crusader force, who were often forced to eat their own horses, or, as legend has it, the bodies of their fellow Christians who had not survived. Bohemond convinced a guard in one of the towers, an Armenian and former Christian named Firouz, to let the Crusaders enter the city. Only four days later, a Muslim army from Mosul, led by Kerbogha, arrived to besiege the Crusaders themselves. Alexios I Komnenos, the Byzantine emperor, was on his way to assist the Crusaders; but upon hearing rumors that the city had fallen to the Muslims, Alexios turned back. The Crusaders withstood the siege, with help from a mystic named Peter Bartholomew. Peter claimed he had been visited by St. Andrew, who told him that the Holy Lance, which pierced Christ's side as he was on the cross, was located in Antioch. The cathedral of St. Peter was excavated, and the Lance was discovered by Peter himself. Although Peter most likely planted it there himself (even the papal legate Adhemar of Le Puy believed this to be the case), it helped raise the spirits of the Crusaders. With the newly discovered relic at the head of the army, Bohemond marched out to meet the besieging Muslim force, which was miraculously defeated — as according to the Crusaders, an army of saints had appeared to help them on the battlefield. There was a lengthy dispute over who should control the city. Bohemond and the Italian Normans eventually won, and Bohemond named himself prince. Bohemond was already Prince (allodial lord) of Taranto in Italy, and he desired to continue such independence in his new lordship; thus he did not attempt to receive the title of Duke from the Byzantine Emperor (in whose name he had taken an oath to fight), nor any other title with deep feudal obligations. Meanwhile, an unknown epidemic spread throughout the Crusader camp; Adhemar of Le Puy was one of the victims. Following Bohemond's capture in battle with the Danishmends in 1100, his nephew Tancred became regent. Tancred expanded the borders of the Principality, seizing the cities of Tarsus and Latakia from the Byzantine Empire. However those newly captured cities along with other territory were lost after the Battle of Harran when Baldwin II of Edessa was captured. Bohemond was released in 1103 and went to Italy to raise more troops in 1104, during which time Tancred remained regent of Antioch. Bohemond used the troops he raised to attack the Byzantines in 1107. Bohemond was defeated at Dyrrhachium in 1108 and was forced by Alexius I to sign the Treaty of Devol, making Antioch a vassal state of the Byzantine Empire upon Bohemond's death. Bohemond had promised to return any land that was seized from the Muslims when the Crusaders passed through Constantinople in 1097. Bohemond also fought at Aleppo with Baldwin and Joscelin of the County of Edessa; when Baldwin and Joscelin were captured, Tancred became regent in Edessa as well. Bohemond left Tancred as regent once more and returned to Italy, where he died in 1111. Alexius wanted Tancred to return the Principality in its entirety to Byzantium, but Tancred was supported by the County of Tripoli and the Kingdom of Jerusalem. Tancred, in fact, had been the only Crusade leader who did not swear to return conquered land to Alexius (though none of the other leaders, save for Raymond IV of Toulouse, kept their oaths anyway). Tancred died in 1112 and was succeeded by Bohemond II, under the regency of Tancred's nephew Roger of Salerno, who defeated a Seljuk attack in 1113. On June 27, 1119, Roger was killed at the Ager Sanguinis (the Field of Blood), and Antioch became a vassal state of Jerusalem with King Baldwin II as regent until 1126 (although Baldwin spent much of this time in captivity in Aleppo). Bohemond II, who married Baldwin's daughter Alice, ruled for only four years, and the Principality was inherited by his young daughter Constance; Baldwin II acted as regent again until his death in 1131, when Fulk of Jerusalem took power. In 1136 Constance, still only 10 years old, married Raymond of Poitiers, who was 36. Raymond, like his predecessors, attacked the Byzantine province of Cilicia. This time, however, Emperor John II Komnenos fought back. He arrived in Antioch in 1138 and forced Raymond to swear fealty to him. There then followed a joint campaign as John led the armies of Byzantium, Antioch and Edessa against Muslim Syria. Aleppo proved too strong to attack, but the fortresses of Balat, Biza'a, Athereb, Maarat al-Numan and Kafartab were taken by assault. Although John fought hard for the Christian cause in the campaign in Syria, his allies, Prince Raymond of Antioch and Count Joscelin II of Edessa sat around playing dice instead of helping John to press the Siege of Shaizar. The city was taken, but the citadel defied assault. The Emir of Shaizar offered to pay a large indemnity, become John's vassal and pay yearly tribute; the offer was reluctantly accepted by the emperor. On the return of the army to Antioch a riot instigated by Joscelin II of Edessa forced the emperor to leave without the citadel being surrendered to him. John had plans to reconquer Antioch and become an effective overlord of the remaining Crusader states, but he died in 1143. After the fall of Edessa in 1144, Antioch was attacked by Nur ad-Din during the Second Crusade. Much of the eastern part of the Principality was lost, and Raymond was killed at the battle of Inab in 1149. Baldwin III of Jerusalem was technically regent for Raymond's widow Constance until 1153 when she married Raynald of Châtillon. Raynald, too, immediately found himself in conflict with the Byzantines, this time in Cyprus; he made peace with Manuel I Comnenus in 1158, and the next year Manuel arrived to take personal control of the Principality. From thence the Principality of Antioch was to be a vassal of Byzantium until Manuel's death in 1180. Although this arrangement meant that the Principality had to provide a contingent for the Byzantine Army (troops from Antioch participated in an attack on the Seljuk Turks in 1176), it also safeguarded the City against Nur ad-Din at a time when it was in serious danger of being overrun. Raynald was taken prisoner by the Muslims in 1160, and the regency fell to the Patriarch of Antioch (Raynald was not released until 1176, and never returned to Antioch). Meanwhile, Manuel married Constance's daughter Maria, but as Constance was only nominally in charge of Antioch, she was deposed in 1163 and replaced by her son Bohemond III. Bohemond was taken captive by Nur ad-Din the following year at the Battle of Harim, and the Orontes River became the permanent boundary between Antioch and Aleppo. Bohemond returned to Antioch in 1165, and married one of Manuel's nieces; he was also convinced to install a Greek Orthodox patriarch in the city. The Byzantine alliance came to an end with the death of the Emperor Manuel in 1180. Antioch was deprived of the Empire's protection, which had been enough to frighten Nur ad-Din away from intervening in the area for the preceding twenty years. Nevertheless, with help from the fleets of the Italian city-states, Antioch survived Saladin's assault on the Kingdom of Jerusalem in 1187. Neither Antioch nor Tripoli participated in the Third Crusade, although the remnants of Frederick Barbarossa's army briefly stopped in Antioch in 1190 to bury their king. Bohemond III's son, also named Bohemond, had become count of Tripoli after the Battle of Hattin, and Bohemond III's eldest son Raymond married an Armenian princess in 1194. Bohemond III died in 1201. Bohemond's death resulted in a struggle for control between Antioch, represented by Bohemond of Tripoli, and Armenia, represented by Bohemond III's grandson Raymond-Roupen. Bohemond of Tripoli, as Bohemond IV, took control by 1207, but Raymond briefly ruled as a rival from 1216 to 1219. 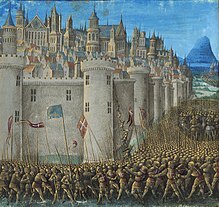 Bohemond died in 1233, and Antioch, ruled by his son Bohemond V, played no important role in the Fifth Crusade, Holy Roman Emperor Frederick II's struggles to take back Jerusalem in the Sixth Crusade, or Louis IX of France's Seventh Crusade. Coin of the Principality of Antioch, 1112–1119, Saint George on horseback. In 1254 Bohemond VI married Sibylla, an Armenian princess, ending the power struggle between the two states, although by this point Armenia was the more powerful of the two and Antioch was essentially a vassal state. Both were swept up by the conflict between the Mameluks and the Mongols. In 1260, under the influence of his father-in-law, the Armenian king Hetoum I, Bohemond VI submitted to the Mongols under Hulagu, making Antioch a tributary state of the Mongol Empire. Bohemond and Hetoum fought on the side of the Mongols during the conquests of Muslim Syria, taking together the city of Aleppo, and later Damascus. When the Mongols were defeated at the Battle of Ain Jalut in 1260, Baibars, the Mamluk Sultan of Egypt, began to threaten Antioch, which (as a vassal of the Armenians) had supported the Mongols. Baibars finally took the city in 1268, and all of northern Syria was quickly lost; twenty-three years later, Acre was taken, and the Crusader states ceased to exist. In the colophons of the Malatia Gospel of 1268 (MS No. 10675), Armenian manuscript illuminator Toros Roslin described the brutal sacking of Antioch by Baibars: "...at this time great Antioch was captured by the wicked king of Egypt, and many were killed and became his prisoners, and a cause of anguish to the holy and famous temples, houses of God, which are in it; the wonderful elegance of the beauty of those that were destroyed by fire is beyond the power of words." The empty title of "Prince of Antioch" passed, with the extinction of the Counts of Tripoli, to the Kings of Cyprus, and was sometimes granted as a dignity to junior members of the royal house. The Lordship of Saône was centered on the castle of Saône, but included the towns of Sarmada (lost in 1134) and Balatanos. Saône was captured by Saladin from the last lord, Matthew, in 1188. Like Jerusalem, Antioch had its share of great offices, including Constable, Marshal, Seneschal, Duc, Vicomte, Butler, Chamberlain, and Chancellor. Wikimedia Commons has media related to Principality of Antioch. ^ a b Steven Runciman (1952). A History of the Crusades, vol. II: The Kingdom of Jerusalem and the Frankish East, 1100–1187. Cambridge University Press. pp. 215–217. ISBN 978-0140137040. ^ Peter Jackson (2005). Mongols and the West. Routledge. p. 167. ISBN 978-0582368965. ^ Hazard, Harry W.; Setton, Kenneth M. (September 15, 1977). "III: Ecclesiastical Art in the Crusader States in Palestine and Syria". A History of the Crusades, Volume IV: The Art and Architecture of the Crusader States (1st ed.). University of Wisconsin Press. p. 137. ISBN 0-299-06820-X. Buck, Andrew D. (2017). 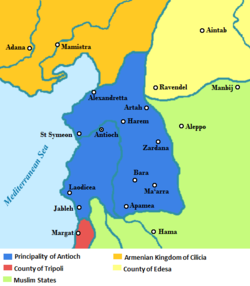 The Principality of Antioch and its Frontiers in the Twelfth Century. Woodbridge: Boydell & Brewer. ISBN 9781783271733.